After Tuesday’s chastening at the hands of Jordan, Singapore’s feet will not be landing on the elevated stage of Round 4 of the World Cup qualifiers, barring a footballing miracle. With no major tournaments left this year for the senior national team, it’s time for national coach Radojko Avramovic and the Lions management to ponder the lessons of the qualifying campaign and look ahead. The first decision that Avramovic and his team will have to take lies over the immediate future of seven Under-23 players currently in the national squad, including keeper Izwan Mahbud and the key duo of Safuwan Baharudin and Hariss Harun. The U-23s can either stay with the Lions for the three remaining matches of the World Cup qualifiers, or head to Jakarta for the SEA Games which will start in the first week of November. Despite his comments to the media that the qualification campaign is not quite done and dusted, Avramovic is a realist and will not hamper the medal prospects of the U-23s by retaining all seven in the senior side. If the Young Lions are to reach the stated goal of the SEA Games final, the presence of Safuwan, Izwan, Hariss, midfielder Shahdan Sulaiman and forward Khairul Nizam will be needed. In particular, Hariss and Shahdan will be vital to the Young Lions midfield, with Zulfahmi Arifin and Nazrul Nazari set for national service call-ups anytime now and looking likely to miss the Games. The real question that Avramovic will be puzzling over is how he replaces the SEA Games-bound players. Safuwan’s spot in central defence may be taken by Ismail Yunos or Sevki Sha’ban, while the options to replace Hariss in midfield include Isa Halim and Noh Rahman. And perhaps, this may open a small window of opportunity for Baihakki Khaizan, the defender dropped after the Asean Football Federation Suzuki Cup last year. There’s time as well for previously uncapped players to shine in the S.League and force their way into the squad, the way Geylang United’s Hafiz Rahim did this year. Beyond the issue of replacing the SEA Games-bound players, Avramovic has to look at the long-term regeneration of the senior national team as well. This year, Singapore have looked vulnerable in defence despite some strong individual performances from the likes of Safuwan and even the veteran Daniel Bennett, who has received plenty of criticism recently. Bennett is 33 though and Avramovic will need to bed in the successor to the man who has been a mainstay of the Lions defence for the past decade. One suspects that Safuwan will eventually grow into Bennett’s role, leaving the stopper position to be fought for by the likes of Afiq Yunos and Shahir Hamzah. The leftback position is one Avramovic will need to scrutinise once more, after Shaiful Esah delivered another poor display against Jordan. The SAFFC man remains in the national team on the strength of his deadball ability, but even that waxes and wanes as Shaiful continues to frustrate. There’s certainly an opportunity for a challenger like Hamqaamal Shah to stake a strong claim for the position. However, the area that requires the greatest retooling is the attack. Singapore’s more expansive passing style will come to naught without an effective attacking trident, and it is telling that against a higher notch of opponents like Jordan, Iraq and China, the Lions were only able to fashion one goal in three games (and that off a gimme error) as opposed to six in two games against Malaysia. The 4-2-3-1 formation favoured by Avramovic now requires pace and incision down the flanks and invention behind the main striker, and Singapore suffer a glaring lack of creativity without Qiu Li. The China-born forward is sadly too often unavailable through injury though, and his presence for future matches must be regarded as a bonus rather than counted on. The return of captain Shahril Ishak to regular league football, be it in Indonesia or in the Malaysian Super League, will help, as will the return of Khairul Amri, another creative talent whose career has been wracked by injuries. Avramovic may also look to elevate the likes of the Young Lions’ Fazli Ayob and Gabriel Quek, pacy and skilful wingers, and Shahfiq Ghani, an intelligent playmaker. At the point of the trident, Aleksandar Duric has provided better and longer service than anyone might have predicted when he first pulled on a Lions jersey as a 37-year-old international debutant in late 2007. His time as the focal point of the Singapore attack is surely up now though, but the national team management will do well to retain him as part of the coaching staff where his experience and professionalism can continue to benefit the Lions. Duric’s replacement, the 20-year-old Khairul Nizam, has already been fast-tracked into the national team. That Avramovic was able to so easily identify Duric’s successor is both a boon and a bane – Nizam is the outstanding forward in his age range, reminiscent of Noh Alam Shah. But he is also the only choice available to Avramovic. At the Young Lions, when Nizam has been out through injury or suspension, the winger Fazli Ayob has had to fill in upfront. The backups Fadhil Noh and Nigel Vanu have yet to shine, while no other S.League club has been able to produce a new Alam Shah or Indra Sahdan. An additional problem that Avramovic has to deal with is the mental makeup of his team. The Lions’ morale collapse after Jordan’s second goal arrived early in the second half was alarming, and no player showed an ability to rise above the panic. The likes of Isa Halim and Hariss Harun remain strong characters though, and they should be encouraged to make themselves heard. Perhaps the trickiest task Avramovic faces is to instil a sense of adventure when challenging technically better opponents, and a resilience when they do fall behind. And perhaps, the only way to achieve that will be to keep going up against the footballing Goliaths, taking every knock and every setback and evolving from them. Very insightful analysis. The WCQ is a great place for these young footballers to contend against tougher opponents and improve their skills. The problem is that Singaporeans’ are already losing their patience with 3 recent losses in this WCQ. Some have even demanded that the dropped players such as Noh Alam Shah & Ridhuan to be called up due to their experiences. 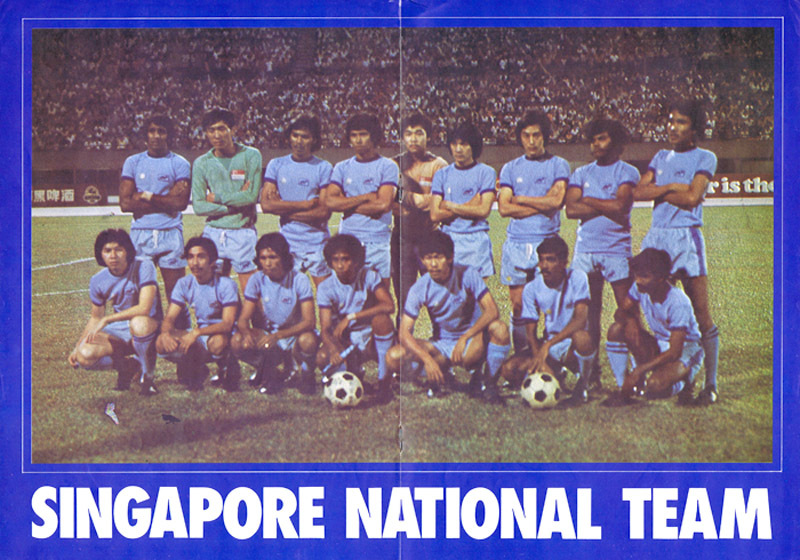 With the upcoming SEA games, I hope FAS will make the right decision for the long-term development of Singapore football instead of only focusing on result, and becoming big fish in a small pond. FAS’s bloody own doing. Oooh, talented 17-year-old, I’ll bring him into NFA, where he’ll not learn from anyone better than him, stagnate for anywhere from 3 to 6 years, before getting released back to S-League clubs (by then he’s 23/24) hardly better than when he first went to the NFA.